Profile Response: Chip Spencer, Marion Junction AL | How Will We Live Tomorrow? 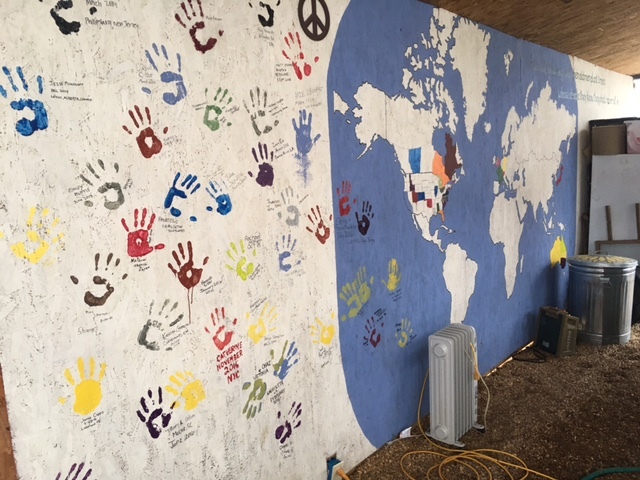 ‘A society grows great when old men plant trees whose shade they shall never sit in.’ This Greek proverb is painted on one wall of the greenhouse at Spencer Farm, next to a map of the world illustrating the home countries of WWOOFers who’ve worked there, their signatures and painted handprints. 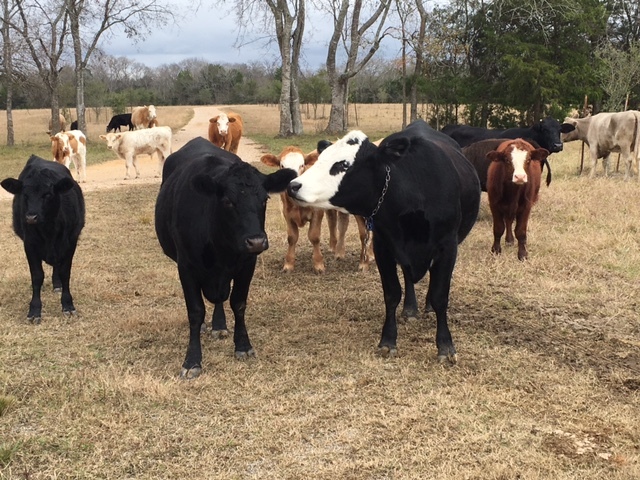 But I’m getting ahead of the story, just as Chip does when he walks his farm, more interested in describing his latest endeavor than how a measly 160 acres of over farmed and neglected Blackbelt land became a showcase for small-scale, profitable, sustainable agriculture. Chip had an excavating business in Marion; his wife Laura was a school teacher who liked horses. Business was good so they started looking for twenty acres or so to raise a few horses. Chip heard about a foreclosure; more land than they needed, but at $335 per acre, a bargain they could not resist. “I had the tools and the desire to make this place work.” They wire cut access from the country road, hauled mounds of trash locals had dumped over the years, and nurtured the bald soil. They built fences and pens, eventually a barn and a house. They worked their jobs all day and built their place nights and weekends. Along the way they had a child, then two. Chip quit his business to focus on the farm, a dubious proposition for a young man with two small children. “My plan was, if we don’t have to spend money, we don’t have to make money.” They started farming for themselves: chickens and pigs and cattle and gardens. They grew enough to sell. “We still need some money; this place can’t give us salt.” They rejuvenated the land, putting more nutrition into the soil than they removed. Planting trees. 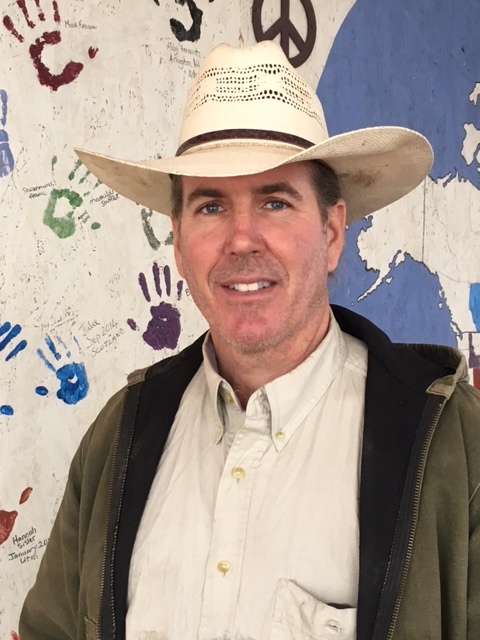 Chip’s focus is local, but his perspective is global. “Forty-one percent of the economic input of Perry Country occurs once a month – that’s how much this county receives in direct federal assistance. Once a person swipes their EBT card at Wal-Mart that money has gone to Arkansas. If we can help people spend that money here, it will stay in the local economy. “The average family of four in the United States will contribute the comparable amount of greenhouse gas as 2500 tress will absorb. So we planted 5,000. There are trees all over the farm. As they planted, and prospered, and appreciated their relationship to the earth, Chip decided to celebrate and give thanks by planting the world’s largest peace sign. “We are twelve miles from Selma, we need to show the world that peace can exist here. Chip planted 59 cedars over seven acres at 43 foot intervals. Cattle graze in and around his work of art and hope. “To be sustainable we have to live simply. We have to learn to cut back, that cutting back can increase the quality of our lives. This entry was posted in Responses and tagged Chip Spencer, Marion Junction AL, Spencer Farm, sustainable agriculture, world's largest peace sign, wwoofer. Bookmark the permalink.